If not for a game-changing gimmick, Starhawk would be like every other third-person shooter you've played. But as far as gimmicks go, this one's interesting, at least. Starhawk is the spiritual successor to 2007's Warhawk, a downloadable PlayStation 3 game that let players fight big multiplayer battles on foot or in vehicles. The new game, which is getting the Blu-ray treatment from Sony, dials back Warhawk's level of freedom in an attempt to impose some strategy. I previewed Starhawk at a Sony press event Monday evening. You start on foot, moving through the battlefield with a speed and momentum that feels a bit like Halo. Combat is also more Halo than Call of Duty, with each firefight turning into a game of who can deplete the other player's shields first. The gimmick is "Rift Energy," collected by killing enemies or completing objectives. Collect enough, and you earn the ability to build powerful structures anywhere on the map, which come crashing down from the sky with terrifying velocity. Each structure can serve a unique purpose. There's a sniper tower, an automated turret, a bubble shield, a simple wall, a beam turret and a garage for gun-mounted SUVs. But the main attraction is a hangar for the game's namesake Hawks. 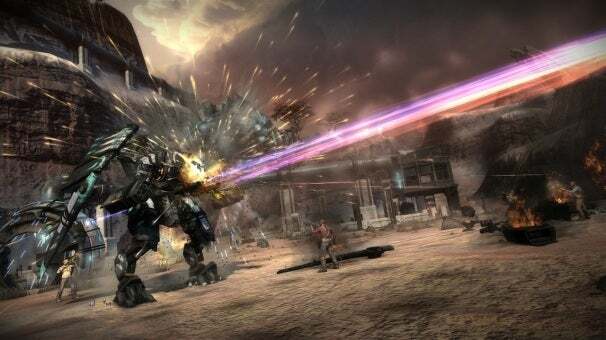 These giant mechs, which pack missiles on one arm and a machine gun on the other, can quickly convert into a jet fighter for fast travel and bombing runs on the enemy. The ability to create structures and vehicles anywhere on the map adds a layer of strategy to Starhawk's otherwise straightforward shooting, and it also speeds up the action. Meanwhile, the structures themselves serve a strategic purpose. A Hawk hanger, for instance, isn't just a spawn point for powerful vehicles, it's an obstacle you can stand on for vantage or hide behind for cover. So far, we've only seen Starhawk's Capture the Flag mode, and Sony hasn't announced what other modes are in store. There will, however, be a single-player campaign that tells the story of Emmet Graves, a hired gun who's been infected by the very Rift Energy that he and all humans seek. They're at war with the Outcast, whose humanity has already been mutated away by the energy. It sounds like standard post-apocalyptic fare, but it sets the stage for Starhawk's team-vs.-team battles. There's word on a release date for Starhawk yet.